Ochsner Education Outreach is committed to supporting the educators and schools in our communities by offering opportunities for furthering curriculum exploration, investigating career options, and providing first-hand experiences through multiple programs, including field trips and job shadows. Field trips at Ochsner are an opportunity for teachers to bring the classroom to life. They provide students with hands-on experience and a chance to observe a hospital atmosphere, understand the uses and importance of equipment, and learn about the career opportunities available within healthcare, science, and research. To request application materials, email educationoutreach@ochsner.org. Contact us as early as possible! Coordination takes a minimum of 3 weeks, and space is limited. To request application materials, email educationoutreach@ochsner.org. 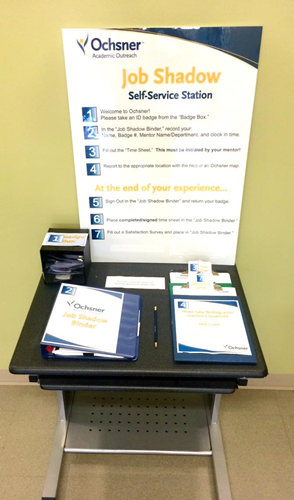 The Job Shadow Sign In Station is now located on the 2nd floor of the Education Center, 1401 Jefferson Hwy. The Education Center is attached to the pedestrian bridge and across the street from the main hospital. On the day of the scheduled job shadow, the student must sign in and receive a badge before reporting to his/her job shadow mentor. Apply online for a Job Shadow. Completed Job Shadow Applications and Time Logs can be faxed to (504) 842-3389, ATTN: Education Outreach.